It has been awhile since I have done an anatomy basics post and it is time to do another. As mentioned in the last anatomy basics post, the next subject is going to be about the muscles of the back. Today, we will look at a few of the muscles of the back. We will look at the location of each muscle, including the origin and insertion points. 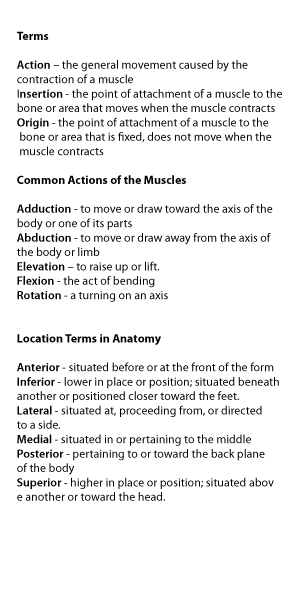 We will also describe each muscle's action. This is a large muscle that spans the neck and upper back. The trapezius moves the scapula around. 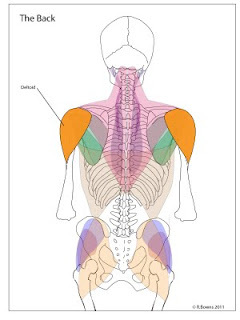 When contracted it can pull the shoulders up in a shrug or bring the shoulder blades closer together. 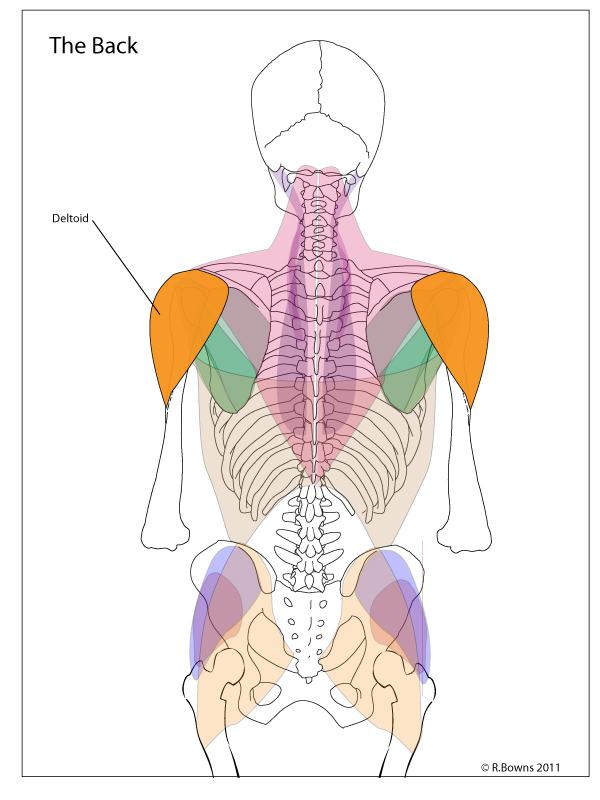 These are the muscles that define the shape of the shoulder. The deltoids start at the shoulder blade and collar bone, cover the top of the humerus and connecting to a point on the shaft of the humerus. These muscles raise the arms, like when reaching for something on the top shelf. This muscle is larger than it may appear in many diagrams of human anatomy. That is because it is covered by several muscles, the trapezius, deltoid, teres major and minor, and the latissimus dorsi. The infraspinatus is a muscle that covers the back of the shoulder blade and attaches to the top of the humerus. Its job is to both rotate and stabilize the arm. Insertion: at the of the head of the humerus on an area called the greater tubercle of the humerus. This is another muscle that connects the shoulder blade to the upper arm bone. The teres major connects to the bottom of the wing of the shoulder blade to the humerus. We use the teres major to rotate our arm in towards the body. Here is one more muscle attaching the shoulder blade to the humerus. However instead of rotating the arm in, the teres minor rates the arm out away from the body. This is the largest of the muscles of the back. 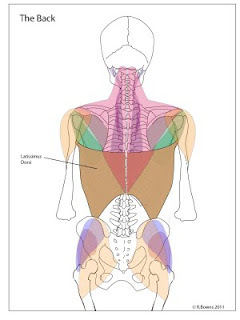 The latissimus dorsi connects the spine, pelvis, and shoulder blades to the humerus.This muscles partially covers the teres major, teres minor, and infrasipnatus. 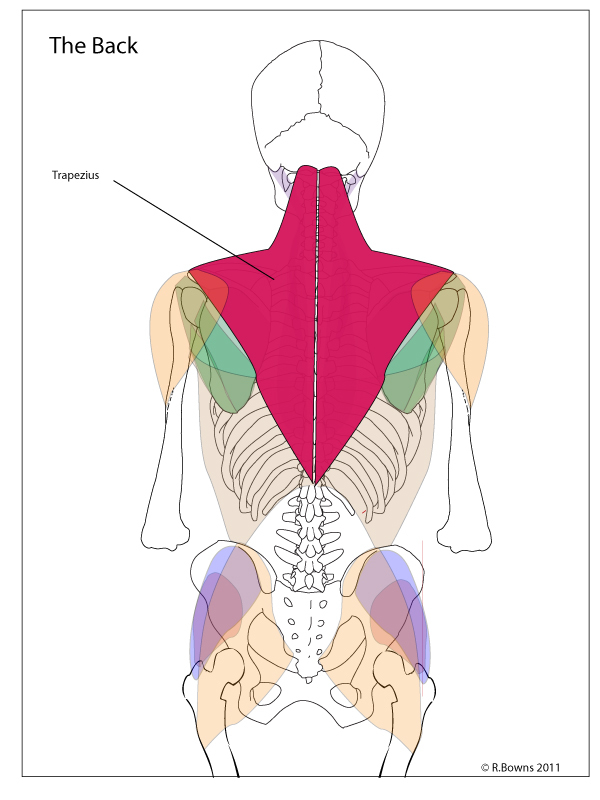 The trapezius partially covers the latissimus dorsi. We use the latisimuss dorsi to pull our arms down and back. There are more muscles found in the back of the torso, but this is a good place to start. 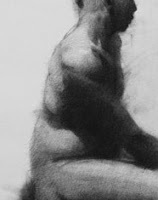 Developing an understanding of the shapes these muscles create and how they move the body will help improve your ability to draw the figure. 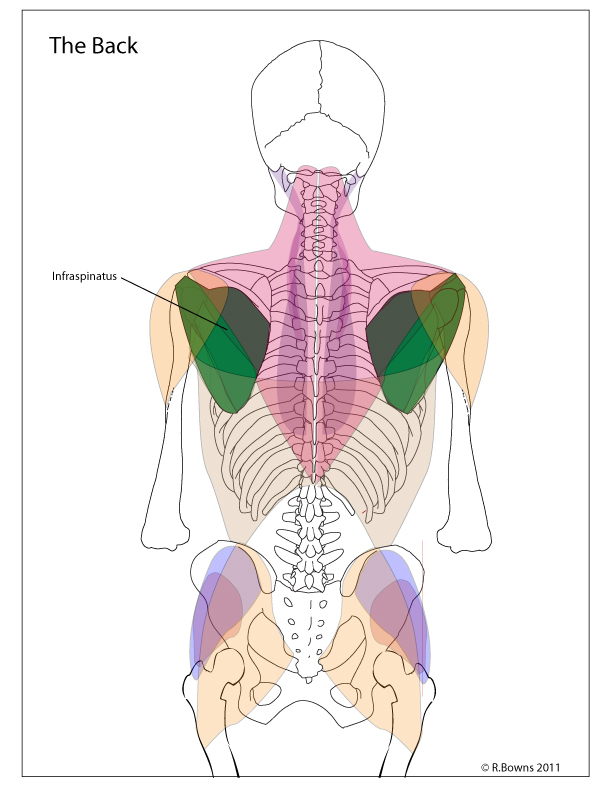 One way to help understand how these muscles are formed and what they do is to move your body using each muscle. For example, bring your shoulder blades in closer together and feel which muscles are tightening.